May 24, 2011 - Bombardier has begun installing semi-automated jigs at its new wing facility in Belfast, Northern Ireland, to support assembly of the advanced composite wings for the all-new CSeries aircraft. The jigs, fixed machinery that will be used to assemble the primary structural components of the composite wing torque box, are being installed in the second phase of a new, state-of-the-art 600,000 sq. ft. (55,742 m2) manufacturing and assembly facility. The first phase of the new factory, which will accommodate the fabrication of the composite components, was completed on schedule towards the end of 2010. Bombardier?s Belfast operation is responsible for the design, manufacture and integration of the advanced composite wings for the CS100 and CS300 jets, including all flight control surfaces and high-lift systems. 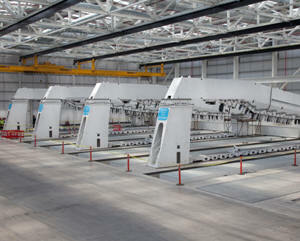 The primary structural components of the wings will be produced using the unique Resin Transfer Infusion (RTI) process that has been developed by Bombardier Aerospace, Belfast engineers. ?The installation of the wing assembly jigs is another milestone that brings us a step closer to producing wings for the CSeries aircraft program,? said Michael Ryan, Vice President and General Manager, Bombardier Aerospace, Belfast. ?The jigs are highly automated and will allow us to control the assembly of the wings with a high degree of precision. We already installed a specially designed assembly jig to produce a pre-production wing technology demonstrator, and are now applying what we have learned from this to the actual production assembly jigs. We are confident that, working with our suppliers, we have implemented a tooling process that meets our high production standards,? continued Mr. Ryan. Last summer, Bombardier successfully completed the ultimate load test on the CSeries aircraft composite pre-production wing, replicating 150 per cent of the most severe forces the wing is ever likely to experience in service. The pre-production wing is part of the overall complex research and development program that Bombardier has undertaken to ?prove out? the new technology, manufacturing and assembly processes it is applying to the composite wing. Meanwhile, all production equipment has been installed in the fabrication section of the new wing facility, which comprises a production area and low contamination ?clean room? area. Equipment installed includes a fabric cutter, a multiple-axis machine cell, pre-formers, an autoclave and non-destructive testing equipment. Production of the CSeries aircraft advanced composite wings is due to begin later this year. The CSeries aircraft, which are optimized for the single-aisle 100- to 149-seat market, will deliver the lowest operating costs in their class, exceptional operational flexibility, widebody comfort and an unmatched environmental scorecard. Bombardier is a world leading manufacturer of commercial aircraft and business jets to rail transportation equipment, systems and services, Bombardier Inc. is a global corporation headquartered in Canada. Its revenues for the fiscal year ended January 31, 2011, were $17.7 billion.